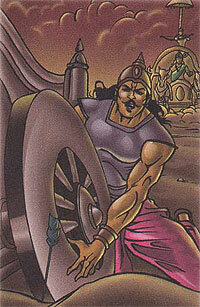 After the fall of Drona, Karna assumed command of the Kaurava army during the battle of Kurukshetra. On the fifteenth day, Arjuna and Karna came face to face. A fast and furious battle took place between the famous rivals. One of Karna's arrows almost hit Arjuna, but Krishna, who was Arjuna's charioteer, lowered the chariot and the arrow missed him. In return, Arjuna shot numerous arrows at him. Suddenly, the wheel of Karna's chariot got stuck in the mud. He got down to push the wheel and asked Arjuna to stop shooting, because it would not be fair to shoot at him while he pushed the wheel out of the mud. Krishna said, "You shot at the unarmed Abhimanyu. was that fair?" Krishna then reminded Arjuna how the Kauravas had broken the code of war when they killed Abhimanyu without mercy. He told Arjuna to do his duty. Hearing this Arjuna was filled with righteous anger and killed Karna.